Do you know how to make Philadelphia cheesecake recipes? Most of my cheesecakes are made with Philadelphia cream cheese. You may have noticed that most of the recipes here in the United States are made with cream cheese where in other countries ricotta, cottage cheese and others are very popular. I like to use the best quality possible when I go to all the trouble of making something so this is why I choose the Philadelphia brand of cream cheese. There is a story to why we Americans use cream cheese in our recipes instead of other cheeses. Philadelphia cream cheese is an American original making it possible for us to learn how to make Philadelphia cheesecake recipes. Over one hundred years ago this cheese originated in New York and this is why the recipe for New York cheesecake is famous. What started out primarily as a delicious spread for bread and crackers soon was found to be very delicious in many recipes. From this operation in New York, the first recipe and the very first of the Philadelphia cheesecake recipes was published in 1928. An instant hit, this started our passion for learning how to make Philadelphia cheesecake recipes. The “Kraft Philadelphia Cream Cake” later became known as the “Supreme Cheesecake”. This was the first time that cream cheese was used as an ingredient in a recipe and not just as a spread. As you can see from my website alone, the variety of Philadelphia cheesecake recipes is huge. This delicious dessert comes in many sizes of cheesecake recipes from huge party size to mini cheesecakes. If you prefer there are cheesecake bars, cheesecake cookies and creamy luscious cheesecake desserts. Besides these differences in size and shapes, the flavors are endless. This was the first of the Philadelphia cheesecake recipes. Combine crumbs, 3 tablespoons sugar and melted butter and blend. Bake in preheated oven at 325F degrees for 10 minutes. INCREASE OVEN TEMPERATURE TO 450F degrees. Combine cream cheese, sugar and flour; mix on medium speed until well blended. Blend in sour cream and vanilla; pour over baked crust. Bake 10 minutes at 450F degrees; REDUCE OVEN TEMPERATURE TO 250F degrees. Continue baking 1 hour longer. Run knife around rim to loosen cake from pan. DO NOT REMOVE SIDES. Cool completely before removing sides; chill for 8 hours or overnight. Top with filling right before serving. 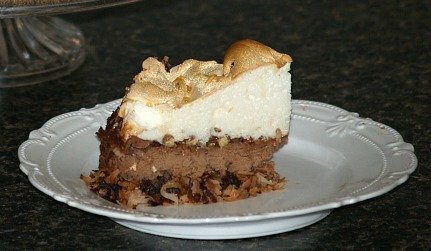 Another great of Philadelphia cheesecake recipes! Combine crumbs, pecans, 3 tablespoons sugar and melted butter. Press crumb mixture into bottom of 9 inch spring form pan; bake for 10 minutes. Combine cream cheese and brown sugar; beat on medium speed until well blended. Beat in melted chocolate and liqueur; bake at 325F degrees for 35 minutes. INCREASE OVEN TEMPERATURE TO 425F degrees. Combine sour cream and 2 tablespoons sugar; carefully spread over cheesecake. Bake for 10 minutes at 425F degrees. Run knife around rim of pan to loosen cake; remove sides AFTER cheesecake is completely cooled. Chill cheesecake for several hours before serving. 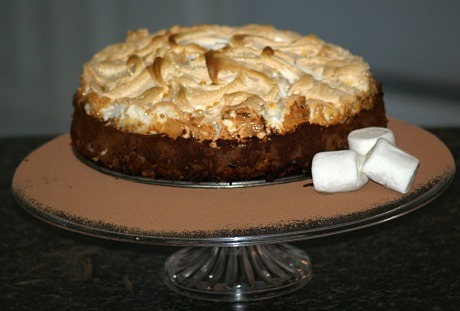 This is one of the Philadelphia cheesecake recipes which has a delicious meringue topping. Combine coconut, ¼ cup pecans and melted butter; press into bottom of 9 inch spring form pan. Combine cream cheese, sugar, cocoa powder, chocolate liqueur and vanilla; mix on medium speed until blended. Run knife around edge to loosen cake; DO NOT REMOVE SIDES. Beat egg whites and salt until foamy; gradually beat in marshmallow cream until stiff peaks form. Sprinkle ½ cup chopped pecans over cheesecake to ½ inch of outer edges. Carefully spread marshmallow cream mixture over top of cheesecake to seal. Bake another 15 minutes or until meringue is light brown. Cool completely; remove sides and refrigerate until cold. I garnished with sifted cocoa powder and marshmallows. Combine crumbs, 3 tablespoons sugar and melted butter; press into bottom of 9 inch spring form pan. Melt chocolate and 2 tablespoons butter over low heat stirring constantly until smooth; cool. Combine cream cheese, 1 ¼ cups sugar and salt in mixing bowl. Beat on medium speed until well blended; add eggs one at a time beating well after each addition. Blend in chocolate mixture and coconut; pour over baked crust. Bake for 55 to 60 minutes or until set; REDUCE HEAT TO 300F degrees. Combine sour cream, 2 tablespoons sugar and brandy and blend; spread over cheesecake. Bake for 5 minutes; run knife around sides of pan to loosen cake from sides of pan. Cool completely before removing sides; refrigerate until cold before serving. Combine cream cheese, ¾ cup sugar and vanilla; beat on medium speed until well blended. Remove 1 cup of batter; blend melted chocolate into 1 cup batter. Spoon plain batter and chocolate batter alternately over baked crust. With knife cut through both batters to make marble effect; bake 10 minutes at 450F degrees. REDUCE OVEN TEMPERATURE TO 250F degrees. Continue baking 30 minutes longer. Run knife around sides of pan to loosen cake from pan; DO NOT REMOVE SIDES. Cool completely; remove sides and chill the Philadelphia Cheesecake Recipe until cold.